Those of you in this mission field know how difficult it is to find truly giant print Bibles at an affordable cost. Well, now they are available! Our hearts were filled with joy at the prospect of helping many of our care home friends grow closer to Jesus. Would you please include a donation of any amount to assist our efforts in equipping Christians to lovingly share God’s word with nursing home residents? 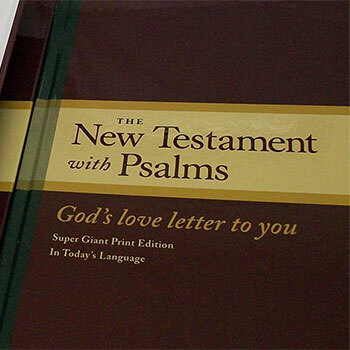 *Please note that these NT/Psalms Bibles are the New Living Translation and contain additional Bible helps to aid the reader. Our intent is that they are not for mass distribution, but for adding a great treasure to your friendships with the residents.